Eliseo Rio Jr. may remain as the acting chief of the Department of Information and Communications Technology (DICT) at least through June. A source with knowledge on the matter told The Manila Times Rio, a retired military general, might keep his position “until end of June” or longer, as President Rodrigo Duterte has yet to appoint a new DICT chief. Although Duterte in November nominated Sen. Gregorio Honasan 2nd for the DICT post, the Commission on Appointment failed to confirm him last year, which means Honasan’s status was “bypassed” and needs to be reappointed by the President. Senate President Vicente Sotto 3rd previously said Honasan would assume the DICT leadership before 2018 ended, or by early 2019. However, the timing as well as issues involving the Constitution might not allow Honasan to get the position from Rio anytime soon, the source said over the weekend. Honasan, a retired Army officer, was already a senator when the law creating the DICT was signed on May 23, 2016. His second six-year tenure at the Senate would end in June. Another order blocking the potential appointment of a new DICT chief is the Commission on Elections Resolution 10429 under the Omnibus Election Code, where so-called “midnight appointments,” or “appointment or hiring of new employees, creation or filling up of new positions …” are prohibited during March 29 to May 12, 2019. The election period kicked off on January 13. Given those, the source said there was no certainty yet as to who would be appointed as the next DICT chief. Even Sotto, himself, on January 10 hinted a possibility that Honasan might be appointed to a different department. Rio, who has been leading the current administration’s third telcocommunications initiative, told The Times in December that if Honasan were to replace him, he could “work well” with the legislator, as the latter expressed support for the department’s current projects, including free WiFi internet access in public places, national broadband plan and common tower policy, among others. The government official served as DICT undersecretary before the President named him in May 2018 as acting chief of the agency. THE stock market fell on Friday, closing out a volatile year that saw it hit a record high in January but then succumb to factors ranging from rising inflation and a weaker peso to the US-China trade war, among others. The benchmark Philippine Stock Exchange index (PSEi) fell by 0.22 percent or 16.64 points to close at 7,466.02 while the broader All Shares inched up 0.08 percent or 3.72 points to 4,517.85. Friday’s finish marked a 12.76-percent drop from the start of 2018 and was also a 17.6-percent plunge from the 9,058.62 peak recorded on January 29. It was the PSEi’s first annual loss since 2016. “It is human nature to want a perfect ending to a story. But looking at the stock market’s performance, it may not be as good as what most hoped for, but it is also not as bad as some feared,” PSE Chairman Jose Pardo said in a statement. Regina Capital Development Corp. head of sales Luis Limlingan attributed Friday’s drop to profit-taking and said sentiment was also weighed down by volatility on Wall Street. US markets looked set to close in the red on Thursday in a see-saw session but a late comeback allowed the Dow, S&P 500 and the Nasdaq to end up for a second straight day. P2P Trade Online sales associate Gabriel Jose Perez, meanwhile, pointed to net foreign selling as having weighed on the PSEi. Foreign funds bought P2.76 billion issues and sold P2.96 billion for a net foreign selling position of P198 million. “Things to watch out for once we resume trading next Wednesday should be first how US markets perform over the long break — more so with how volatile trading has been recently,” Perez said. “December inflation is also set to come out next Friday, so that’s something we should watch out for. A figure at the lower end of the Bangko Sentral ng Pilipinas’ recently released 5.2-6.0 percent range could give strength again to the index,” he added. Regional markets were mixed as investors greeted Wall Street’s rally with caution. Tokyo fell by 0.31 percent while Hong Kong and Shanghai rose by 0.10 percent and 0.4 percent, respectively. In Manila, sectoral results were mixed with the property, services, and financials the only gainers. More than 1.29 billion issues valued at P5.66 billion were traded. Winners led losers, 119 to 81, while 48 issues were unchanged. Looking ahead, Timson Securities Inc. trader Jervin de Celis said the market could climb back to the 9,000 level should local corporate earnings and the economy improve. The same factors behind this year’s volatile trading — the US-China trade war, US Federal Reserve rate hikes and domestic inflation — are still expected to continue influencing the market. “The trade rift between the two economies (China and the US) has to improve to restore investors’ confidence in risky assets like stocks. If they come to a win-win agreement early next year it will buoy the market sentiment,” de Celis said. “On the other hand, if the talks on trade do not go well, it might further slow down the Chinese economy and this may dampen the market sentiment in the short run,” he added. The US Fed’s announcement that it will likely hike rates by only two times next year instead of three, de Celis continued, will help attract foreign funds back to emerging markets such as the Philippines. “We may see a comeback of foreign investors,” he said. Consumer spending, meanwhile, is expected to pick up in the second quarter amid mid-term election spending. “The scary possibility in 2019 is an inverted yield curve in the US, which may signal or cause a recession,” de Celis also said. “It’ll send rippling effects across financial markets and may drag our index below 7,000 again but if our economy remains resilient then the bright side of that story is that foreign funds may flow back into our index especially when the Fed decides to implement expansionary monetary policies to stimulate the economy,” he added. For Regina Capital’s Limlingan, the PSEi could be boosted by the mid-term elections, lower inflation, continued crude oil price drops and a stable monetary policy. Challenges could arise from developments in the US-China trade war, a widening trade deficit that could lead to a further depreciation of the peso, and a deceleration in global growth. MANILA — The Department of Information and Communications Technology (DICT) announced that it will hold public consultations on its draft terms of reference (TOR) for the entry of a new telecommunications player on July 6, 2018. In an advisory to media Monday, the DICT said that the consultations will be held on Friday morning at the Crowne Plaza Hotel Galleria in Ortigas Center, Quezon City. “Two versions of draft Terms of Reference (ToR) published in the DICT website will be presented: (1) using the Highest Committed Level of Service (HCLOS) formula; and (2) using auction as mode of selecting the New Major Player. Output of this consultation shall be a significant contribution to the DICT and the Oversight Committee,” the DICT said. The DICT has released last Thursday its proposed guidelines on the auction of frequency spectrums under a second set of draft guidelines for the selection of the third major telco player. According to the guidelines, a bidder that will offer the highest annual capital and operating expenditure for a 5-year commitment period shall be selected as the new major telco player. The new telco player shall be subject to the applicable spectrum user fees pursuant to prevailing rules and regulations after the said period. Participants should have a minimum bid amount of PHP 36.58 billion. The newer guideline is an alternative to the earlier terms of reference dated June 26, which used the Highest Committed Level of Service (HCLoS) as basis for the selection of a new telco player. A third telco player should have an annual capital and operating expenditures worth PHP40 billion, must have coverage of at least 30 percent of the national population and a minimum average broadband speed of 5 Mbps according to the earlier guidelines. The criteria for the selection were set as follows: 40 percent for national population coverage, 20 percent for minimum average broadband speed and 40 percent for annual capital and operating expenditure over a five year commitment period. The latest draft of the guidelines was made in accordance with the preference of the Department of Finance (DOF) for an auction of the frequencies that will be assigned to a third telco player. The DOF is a member of an oversight committee to assist the NTC in the formulation of the guidelines for the selection and assignment of radio frequencies for the entry of new telco player. The committee is composed of the DICT secretary as chairperson; Finance secretary as vice chairperson, Office of the Executive Secretary and the National Security Adviser. The DICT has earlier expressed opposition to the auctioning of frequencies as this will force a new player to put up a huge amount to qualify for the bidding process, which is not related to the setting up telecommunication facilities and improvement of services. Gross Domestic Product (GDP) grew by 6.9 percent in the third quarter of 2017. Manufacturing, Trade, and Real Estate, Renting and Business Activities were the main drivers of growth for the quarter. Among the major economic sectors, Industry recorded the fastest growth of 7.5 percent followed by Services with 7.1 percent growth. Meanwhile, Agriculture slowed down by 2.5 percent from 3.0 percent growth in the previous year. Net Primary Income from the Rest of the World (NPI) grew by 5.7 percent compared with the 4.1 percent growth recorded in the same quarter of the previous year. As a result, Gross National Income (GNI) posted a growth of 6.7 percent. With the country’s projected population reaching 104.9 million in the third quarter of 2017, per capita GDP grew by 5.4 percent. Meanwhile per capita GNI and per capita Household Final Consumption Expenditure grew by 5.2 percent and 3.0 percent, respectively. The Business Process Outsourcing (BPO) sector started to see the need to heighten efforts to address the possible impact of what is described as “disruptive technological headwinds” — such as artificial intelligence (AI), automation, and robotics — to the industry’s Filipino workforce. This, while the sector is now projected to only grow by 9 percent annually starting this year until 2022 in terms of revenues, which is slower than the “mid-teen” growth it experienced in previous years. Information Technology and Business Process Association of the Philippines (IBPAP) President Rey Untal said that with the “looming threat of AI and automation” to the BPO sector, their organization decided to elevate the discussion on this issue during the upcoming 9th International IT-BPM Summit in October. “Many experts are predicting that the workforce is in danger of being replaced by automation but that is simply not the case. What is often overlooked about automation is that while it is expected to impact certain jobs in the sector, this will also enable the IT-BPM Industry to move up the value chain, resulting in an increase in mid-skilled jobs and high skilled services,” Untal said in a briefing on Wednesday held in Makati. “That is why it is important for us to continue the conversation at the Summit, where we have experts flying in from all over the globe to discuss the impact of technology and the future of the industry in great deal,” he added. A data from the Philippine Statistics Authority (PSA) showed that new investment pledges in the IT-BPM sector actually went down by 34 percent year-on-year in the second quarter, while investment commitments in BPO sector alone particularly slid from R6.27 billion to R4.9 billion from April to June period. Jojo Uligan, Contact Center Association of the Philippines (CCAP) President, said the industry wants to answer all the issues affecting the industry, especially on the concerns regarding AI and automation. To date, call center operations represent 67 percent of this industry. “We need to protect our industry and workers. We’ve been talking about this for awhile. Our success in this industry is our people. We have to make sure that we protect them, make them stay relevant, and educate them. Yes, the industry would feel certain impacts but what we are focusing on are the opportunities,” Uligan also told reporters. Meanwhile, officials of real estate services firm Santos Knight Frank shared a rather different outlook on the BPO sector. While the popular sentiment is that the sector will slightly retrieve — eventually paving the way for online gaming sector to emerge as the top taker of office spaces in the country — moving forward, the multinational company said the office space demand from the BPO sector will actually even grow faster than usual. For one, Santos Knight Frank Senior Director for Research and Consultancy Jan Custodio doesn’t believe that online gaming sector, even if it’s starting to grow a bit faster now, can outshine BPO in terms of office space take-up. “We are not seeing a slowdown in the BPO sector any time soon. Online gaming will just augment the growth in the office sector. We are not worried about online gaming growing too fast,” Custodio said in a different press briefing also held yesterday. “We have a different position from IBPAP and other service providers… We believe the BPO sector will continue to grow in the future,” he added. To recall, Real estate expert David Leechiu said earlier this week that as the slowdown of inflow of BPO investments in the country becomes more apparent, online gaming is now seen as a potential saving grace for the real estate sector as it is projected to take up the demand for office spaces. — The Land Transportation Franchise and Regulatory Board on Monday announced suspension of the accreditation of ridesharing company Uber for one month. The LTFRB also ordered the company to cease and desist operations of its online booking application, which allows users to book rides on their smartphones. The board said the order is effective immediately. “In an order dated 14 August 2017, the board meted out the penalty of one month suspension on the accreditation of Uber System, Inc. and was ordered to cease and desist its operation of their online booking application during the period of suspension,” LTFRB said in its advisory. “The board strongly recommended to respondent Uber to extend financial assistance to its affected peer-operators during the period of suspension as an expression of good faith as their accredited peer-operators would not have suffered current predicament were it not for the predatory actions of respondent Uber,” it added. LTFRB said the following agencies were given copies of the order for enforcement: Metro Manila Development Authority, Philippine National Police – Highway Patrol Group, and Land Transportation Office. In July, the LTFRB directed ridesharing companies Uber and Grab to stop the operations of transport network vehicle services drivers who do not have the required certificates of public convenience (CPCs) or provisional authorities that grant them franchises to operate. The board said the order would become executory on July 26. However, this directive earned negative criticims from both drivers and the riding public. Both Uber and Grab earlier admitted they continued accepting drivers into their platforms despite the LTFRB’s directives. With the country’s projected population reaching 104.5 million in the second quarter of 2017, per capita GDP grew by 5.0 percent. Meanwhile per capita GNI and per capita Household Final Consumption Expenditure (HFCE) grew by 5.3 percent and 4.4 percent, respectively. Presidential Spokeperson Ernesto Abella with DICT Secretary Rodolfo A. Salalima, MMDA Chairman Danny Lim, with stakeholdeers of the EDSA Wi-Fi Project. Globe Telecom Inc. and PLDT Inc. support the Department of Information and Communications Technology (DICT) for the EDSA Wi-Fi project, providing high-speed Internet in the stations of the Metro Rail Transit Line 3 (MRT-3) and along the stretch of EDSA. The free Wi-Fi project will cater to the estimated 500,000 riders of the MRT and passengers of the more than 300,000 vehicles that ply EDSA every day. On the occasion of our country’s 119th Independence Day celebration last Monday, the Department of Information and Communications Technology led the inauguration of the “EDSA WiFi” project for commuters along EDSA. The project is in line with DICT’s mandate to foster connectivity and improve public access to the Internet. The department also said that they wish to promote telecommuting to boost productivity while stuck in traffic or waiting for the next train to arrive. The EDSA WiFi will make high-speed Internet connectivity available at street level throughout the whole 24-kilometer stretch of Metro Manila’s thoroughfare. The project includes all 13 stations of the MRT Line 3, from Taft Avenue in Pasay City to North Avenue in Quezon City. To ensure the availability and resilience of the free public WiFi service, the DICT has tapped the facilities of the country’s largest ISP’s: PLDT and Globe Telecom. “This public WiFi offering is a gift to the people of this free nation. We work to give Filipinos access to the information and technology that they need in their daily live. EDSA WiFi will benefit the hundreds of thousands of commuters along EDSA daily,” said DICT Secretary Rodolfo A. Salalima during the launch ceremonies held at the MRT3 Shaw Boulevard Station. But, even before the official launch of the EDSA WiFi project last Monday, different press releases from the two major telcos have been circulating the interwebs. This created some sort of confusion to some, as different Internet speeds, data cap and number of free minutes had been reported. The table shown serves as an ultimate guide for the first phase of the EDSA WiFi project. There are three available APN’s for the general public to connect with. Both Smart and Globe are time-based without data cap, while the DICT connection gives the unlimited number of minutes but only up to 100MB of data bandwidth allocated per user (device) daily. So, it is possible for one to use the Smart APN first (for example), then once the 30 minutes allocation is done, he/she may connect with the Globe APN. Once the Globe APN connection is also maxed out, one may opt to use the DICT APN and enjoy 100MB of data connection via WiFi for free. *The Smart WiFi service lets you extend your free 30-minute session per day by purchasing Smart WiFi load from partner retailers or by converting your Smart, Sun, or TNT load to Smart WiFi minutes using WIFI10, WIFI20 or WIFI50 keywords sent to 99912. ** Globe/TM customers and other networks can avail of a GoWiFi Promo to continue their browsing by connecting to a @GoWiFi_Auto APN once the free minutes are up. Service can be paid using prepaid load, charged to a postpaid bill, credit card or via the Request-a-Fi feature. GoWiFi Auto currently gives a FREE 3-day trial period for new service users, valid until 31 August 2017. The first stage of the EDSA WiFi project will cover all 13 MRT3 Stations and the continuous stretch of EDSA from Guadalupe to Cubao at street level. The second stage will cover EDSA from Cubao to North Avenue and from Guadalupe to Taft Avenue, which will be operational before the President’s SONA on July 24th. I will conduct a station-by-station internet speed test in the coming days. ‘Colorum’ transport network vehicles under Grab and Uber were given the chance to operate and charge their passengers until December this year as transport officials have yet to come up with improved policies on regulating the ride-sharing industry. Land Transportation Franchising and Regulatory Board (LTFRB) member and spokesperson Aileen Lizada said they aim to release before the end of 2017 the revised guidelines on regulating the operations of transport network companies (TNCs) and transport network vehicles services (TNVS). “It can be by revising the DOTR (Department of Transportation) order, it can be also how to treat the TNCs. We will propose it before Congress,” Lizada said. She clarified that in the absence of such an order, no apprehensions will be conducted against TNVS units that are operating without franchises. The LTFRB was supposed to start its crackdown on colorum TNVS after it ordered Grab and Uber to stop deploying unaccredited operators into the roads. “We ordered them to deactivate all those without franchise, but since they filed their MRs (motions for reconsideration), we had to treat them first,” Lizada said. The LTFRB has yet to release its decision on the appeals by Grab and Uber last July 20. A tecnhical working group (TWG) composed of the DOTr, LTFRB officials, and representatives of Grab and Uber, was to meet Wednesday afternoon to discuss the issues on the ride-sharing transport sector. Lizada said they will put a cap on the number of the TNVS that can operate and charge passengers. “We need to address how many (drivers) are active in a day. How many are online and what time?…At the end of all the tecnhical working group (meetings), we will have the numbers,” she said. According to Lizada, only around 14,000 TNVS are actually allowed to operate. They include the 3,700 which were given franchises and the more than 10,000 whose applications are still pending. Lizada said only Grab as of press time had submitted its list of active operators as of June 30. She said they are still waiting for Uber to give them the data of its 28,000 operators. The LTFRB official said they will also tackle in their meeting Grab’s and Uber’s business model which had already been violated. “It was supposed to be a ride-sharing, meaning, the owner should be the driver. That the owner will share his vehicle to passengers. But we learned that this has become a business that an operator had 10 units. It should not be that way,” she said. Lizada said they will consider suggestions from legislators to give Grab and Uber the franchise as operators for all the TNVS under their platforms. Gross Domestic Product (GDP) posted a 6.4 percent growth in the first quarter of 2017. Manufacturing, Trade, and Other Services were the main drivers of growth for the quarter. Among the major economic sectors, Services had the fastest growth of 6.8 percent. Industry decelerated to 6.1 percent as compared with the 9.3 percent growth recorded in the first quarter of 2016. Meanwhile, Agriculture recovered with 4.9 percent growth from a decline of 4.3 percent from the previous year. Net Primary Income from the rest of the world (NPI) slowed down by 3.9 percent compared with the 9.4 percent growth recorded in the same quarter of the previous year. As a result, Gross National Income (GNI) posted a growth of 5.9 percent. On a seasonally adjusted basis, GDP and GNI grew quarter on quarter by 1.1 percent and 1.0 percent, respectively. Agriculture, Hunting, Forestry and Fishing (AHFF) and Services rose by 1.6 percent and 1.4 percent, respectively. Likewise, Industry expanded by 0.4 percent from the previous quarter. With the country’s projected population reaching 104.1 million in the first quarter of 2017, per capita GDP grew by 4.9 percent. Meanwhile, per capita GNI and per capita Household Final Consumption Expenditure (HFCE) grew by 4.4 percent and 4.2 percent, respectively. DAVAO CITY – The Philippine economy grew 7 percent during the second quarter, the last three months of the Aquino administration, amid robust spending for the national election held last May, the Philippine Statistics Authority announced Thursday. The growth posted during the April to June period was faster than the 5.9 percent posted a quarter ago as well as 6.8 percent in the first quarter. 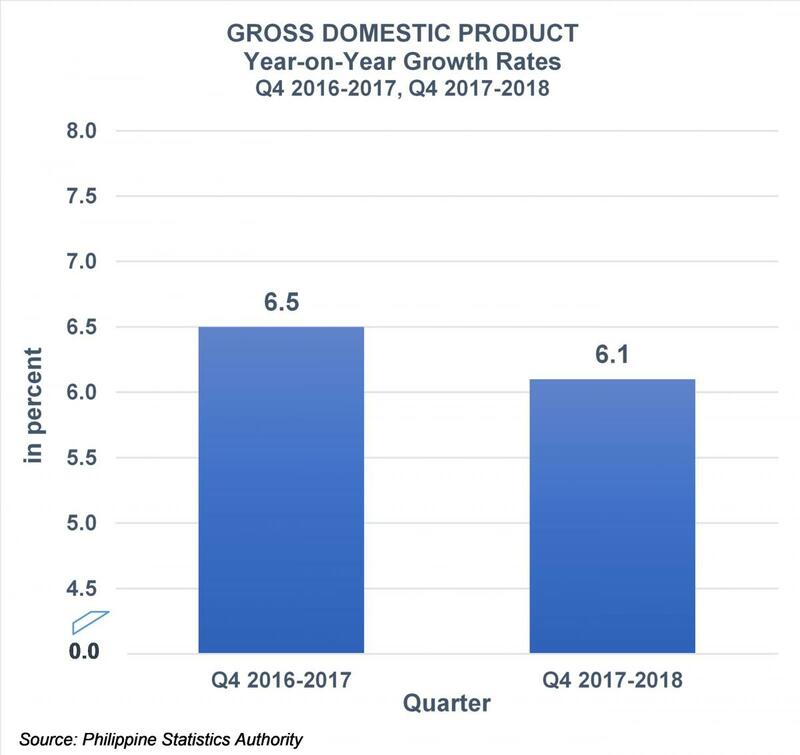 The average gross domestic product (GDP) growth in the first half was 6.9 percent, National Statistician Lisa Grace S. Bersales said in a press conference. The Duterte administration targets the GDP to grow by a “conservative” 6-7 percent in 2016, as economic managers had downscaled the Aquino administration’s target of 6.8-7.8 percent growth for this year, citing adjustments to be made in the next few months as the new administration settles down. Finance Secretary Carlos G. Dominguez III had said the Duterte administration wants the robust economic growth being enjoyed by the country—the average GDP growth during the Aquino administration was the fastest since the late 1970s—to be felt in terms of poverty reduction. The country’s Gross Domestic Product (GDP) grew by 6.9 percent in the first quarter of 2016, the highest since the second quarter of 2013, from 5.0 percent the previous year. The main driver of GDP growth for the quarter was the Services Sector which accelerated to 7.9 percent from 5.5 percent while Industry grew by 8.7 percent from 5.3 percent posted last year. On the other hand, the Agriculture sector declined by 4.4 percent, the fourth consecutive quarterly decline since the second quarter of 2015, from a growth of 1.0 percent in the first quarter of 2015. Net Primary Income (NPI) from the Rest of the World grew by 10.7 percent from 0.5 percent the previous year, driving the Gross National Income (GNI) to post a growth of 7.6 percent, the highest since the third quarter of 2013, from the previous year’s 4.1 percent. With the country’s projected population reaching 102.6 million in the first quarter of 2016, per capita GDP grew by 5.2 percent from 3.2 percent in the same quarter of 2015. Per capita GNI grew by 5.8 percent and per capita Household Final Consumption Expenditure (HFCE) grew by 5.3 percent from last year’s growth of 2.4 percent and 4.3 percent, respectively. The country’s Gross Domestic Product (GDP) in the fourth quarter of 2015 grew by 6.3 percent, the highest quarterly growth for the year. The growth, however, is slower than the 6.6 percent posted in the same period of last year. The fourth quarter GDP was driven by the Services sector which accelerated to 7.4 percent from 5.6 percent while Industry decelerated to 6.8 percent from 9.1 percent. On the other hand, Agriculture contracted by 0.3 percent from a growth of 4.2 percent in the previous year. The fourth quarter growth paved the way for the economy to grow by 5.8 percent for the whole year of 2015 from 6.1 percent in 2014. Services was the main driver of the economy at 6.7 percent growth from 5.9 percent the previous year. Industry and the entire Agriculture both decelerated with 6.0 percent and 0.2 percent from 7.9 percent and 1.6 percent, respectively. Meanwhile, Net Primary Income (NPI) from the Rest of the World grew by 5.4 percent in the fourth quarter of 2015 from 1.4 percent the same period last year, driving the Gross National Income (GNI) to post a growth of 6.2 percent from the previous year’s 5.7 percent. On an annual basis, GNI slowed down to 5.4 percent in 2015 from 5.8 percent the previous year with the deceleration of NPI to 3.6 percent in 2015 from 4.1 percent in 2014. NINE countries have vowed to invest more in the Philippines on the heels of the recently-concluded Asia Pacific Economic Cooperation (Apec) Leaders’ Meeting hosted by the country on November 18-19, the Department of Labor and Employment (Dole) said Monday. Countries that vowed investments are Australia, Japan, South Korea, Mexico, New Zealand, Peru, Papua New Guinea, Russia, and the United States. “These potential investment and employment opportunities are tangible outcomes of the Philippines’ hosting and active participation in the Apec,” said Labor Secretary Rosalinda Baldoz in a statement. Australia may invest in the processed food and agribusiness, IT-BPM, engineering services, and infrastructure sectors. Baldoz said there can also be possible jobs from investments from Mexico in the areas of infrastructure and energy, manufacturing of electronics, food/agribusiness, pharmaceutical and medicine, aerospace, fabricated metal products, and consumer products. Russia is interested in the IT-BPM sector, processed and specialty food manufacture, non-renewable and renewable energy, design-driven products, and aerospace. New Zealand’s potential investments, meanwhile, could create more employment opportunities are in processed food and agribusiness, IT-BPM services, engineering services, infrastructure and other public-private partnership projects, auto parts exports, and manufacturing. The labor chief also said there are identified investment opportunities from Peru in the country’s infrastructure, energy, manufacturing of electronics, food/agribusiness, pharmaceutical and medicine, aerospace, fabricated metal products, and consumer products. Baldoz said the country also welcomes Papua New Guinea investments in infrastructure/PPP, IT-BPM, shipbuilding, energy, and agribusiness. Papua New Guinea is also interested in the areas of cannery, consulting, engineering, building and construction, services sector, retail, ports development, air services, agriculture and agro-industries (exchange of professionals/scientists, information, and technology; and collaborative studies on agriculture and cooperation in rice farming and production). Japan, meanwhile, brings potential for jobs in the copper mining industry and manufacturing sector, specifically for auto parts, printer, and printing parts, and medical devices; as well as from investments in the services sector, particularly on IT-BPM and gaming development; and the expansion of the Japan-Philippines Economic Partnership Agreement for the deployment of other Filipino professionals to Japan. With South Korea, there are potential jobs in the established trade agreement covering investment opportunities for ship building, automotive manufacturing, electronics manufacturing (printers, integrated circuits, LED modules), agribusiness (food production and processing), renewable energy, banking and finance, and tourism (hotel, retirement village, infrastructure).